We know how important it is for your businesses to rely on well produced wallmounts, racks, and brackets to keep your important electronic equipment in good shape and in good working order. That being said, you should consider using Gruber wall mounted server racks and brackets to hold your equipment off the floor and keep your company servers in top shape. 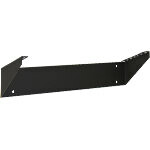 The 19" hinged wall mount brackets are manufactured with a 4" depth to allow space for cable management. The 19" hinged wall mount brackets use the standard EIA hole pattern. 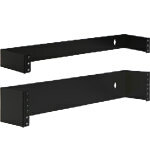 Our 12 inch Deep Wall Mount Brackets are a convenient way to accomplish your rack mounting needs while you save space without bulky full-sized racks. 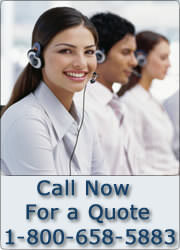 Designed for all 19-inch patch panel equipment. 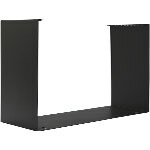 2U, 3U, or 4U Vertical Wall-Mount Brackets allow rack-mounting equipment vertically or horizontally flush against the wall or under a desk, hence occupying minimal depth. The 12U hinged rack provides a solution for smaller networking equipment, punch-downs, and patch panels in areas where floor space is at a premium. 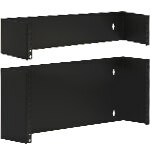 Designed to mount onto standard 16" wall studs, this 19 space rack unit has a durable black textured steel frame that provides a 100 lb load rating. 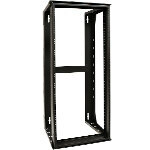 Essential for providing support to security equipment, patch panels, or routers, this 26U wall mount rack is essential for server or telecommunication rooms. 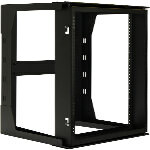 A wall mount network rack is the perfect solution for anyone who is big on technology but needs a small footprint. 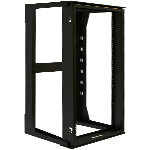 Wall mount server racks acts as a shelf for your server and other important and expensive electronic equipment, and since they’re connected to the wall with a wall mount bracket, you can be sure they’re sturdy and reliable. And by providing an off-the-floor storage space for your equipment, these racks will not only save you some extra floor space, but will also keep your servers elevated and out of harm’s way. So if you’re looking for a space-saving and secure way to store your servers and other important electronic equipment, then Gruber Communication Products is the place for you. By using one of our wall mount server racks, you’ll be able to take your mind off any worries about your expensive electronics, and focus more on getting your work done.